“Omigod, you guys!” This comedy has captured the hearts of millions and became a hit musical. Legally Blonde is an inspiring story of discovering one’s strength in the face of social pressures and personal challenges. Fashion School Daily encourages everyone to catch one of the final shows by the Academy of Art University School of Acting before the production ends its successful run on May 14th. In addition to catchy tunes, cool dance moves and exciting staging, the show features oh so many stylish costumes! Designing for an entire musical is no trivial task. Alina Bokovikova, Costume Design Coordinator, is happy about the results of this creative collaboration with the School of Acting. The process begins by reading the script, identifying characters and rendering concepts for each. Students from the FSH 342 Costume Production 2 course were working on designs for musical theatre, dance, and experimental performance. By exploring these distinct styles in the context of a single production, the students could connect design to movement and voice and expand their professional portfolios. 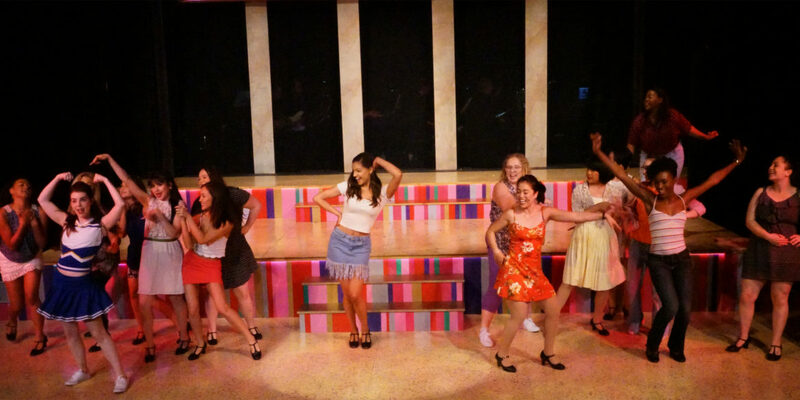 “This musical is a play, times ten”, exclaimed Zahra Jangbar (BFA Costume Design). “It’s huge, campy and cheesy. Musicals have multiple numbers and all the actors on stage must have a cohesive look.” The band scenes were the most challenging, given the number of participants. It required correct sizing and a keen eye for detail. The production is full of hidden costume tricks and quick changes. Sometimes the dressers have mere seconds to officiate a costume change. The lead character, Elle Woods, played by India Jarvis has 38 costume pieces and the most number of changes, including a pink dress that gets ripped off to reveal another garment underneath. “In the costume trade, we call it quick rigging,” explains Morgan Louie (BFA Costume Design) who worked on constructing this dress that features prominently in the narrative of the show. Technical rehearsals can be nerve-wrecking for a costume designer as there’s always a chance to identify and fix potential mishaps before the opening day. One never knows when a strap or a button or a seam can go haywire. It’s crucial to keep one’s cool backstage at all times and carry an emergency sewing kit. “Everything needs to be ready and perfect,” noted Alina Bokovikova. Thirty actors with an average of five costumes each and over 500 garments and accessories to keep track of… Legally Blonde gives the students of Costume Design an opportunity to experience the fast pace and high stakes of a large scale live musical production. “I was living in ignorant bliss, ’til I learned I could be more than this!” In words from one the show’s most beloved songs, students who worked backstage and people who enjoy it in the audience both learn a lesson in the value of practicing and staying on top of one’s dream. The show runs through May 14, 2017 at the Theater @ 620 Sutter.